May 11, 2016 - Are You Losing Sleep Over Money? Here’s What You Can Do. 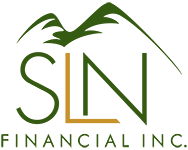 | SLN Financial, Inc.
May 11, 2016 - Are You Losing Sleep Over Money? Here’s What You Can Do. Stop worrying and start preparing. Research has shown that a lot of anxiety and worry is tied to uncertainty.3 As people approach a life transition like retirement or having children, worries about the unknown can ratchet up the stress. While we can’t anticipate every variable, exploring options and making concrete preparations can help you take control and improve your psychological wellbeing. Get professional advice to tackle your issues. If you have specific problems you need to address like debt management, retirement savings, or budgeting, a professional can help you understand your situation and present options. Often, just having an objective assessment of your situation helps reduce your anxiety. Tune out the noise. If market fluctuations are stressing you out, turn off the television and stop looking at your investment statements. If you have a long-term investment strategy that’s tied to your overall financial goals, short-term market movements shouldn’t affect your overall picture. If you haven’t reviewed your investment strategies in some time or have specific concerns, speak to a financial professional to get some clarity. Track your expenses. Many Americans don’t know where their money goes each month and that uncertainty can add to financial stress. Online or software-based money management tools can import all of your bills, credit cards, and financial accounts to help you understand your spending patterns. Once you understand how you are spending, you can budget more effectively. Anxiety about money isn’t good for your health or your most important relationships. Assessing the situation and taking steps to improve it are critical to making progress toward your financial goals. If money worries are keeping you up at night, please give us a call – we’d be happy to sit down with you and review your situation.